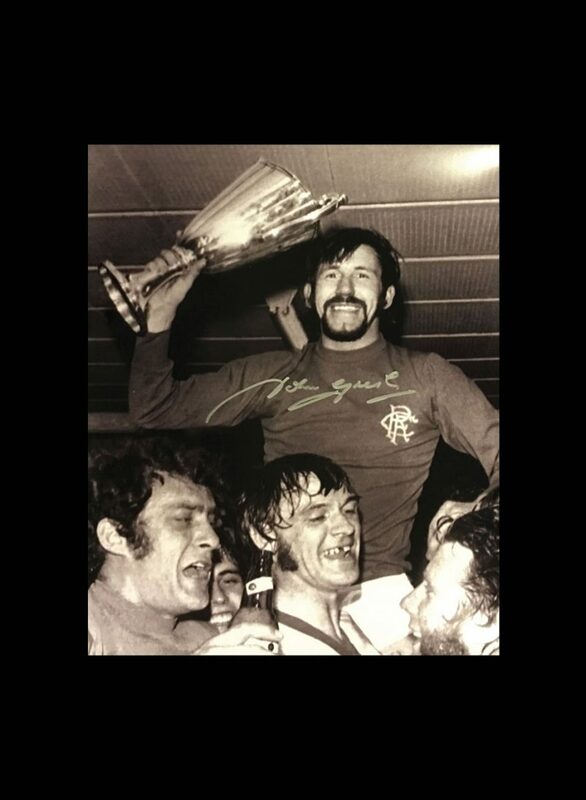 Here is a 16×12 photo of John Greig celebrating with the team after their historic 1972 European Cup Winners’ Cup Final victory. 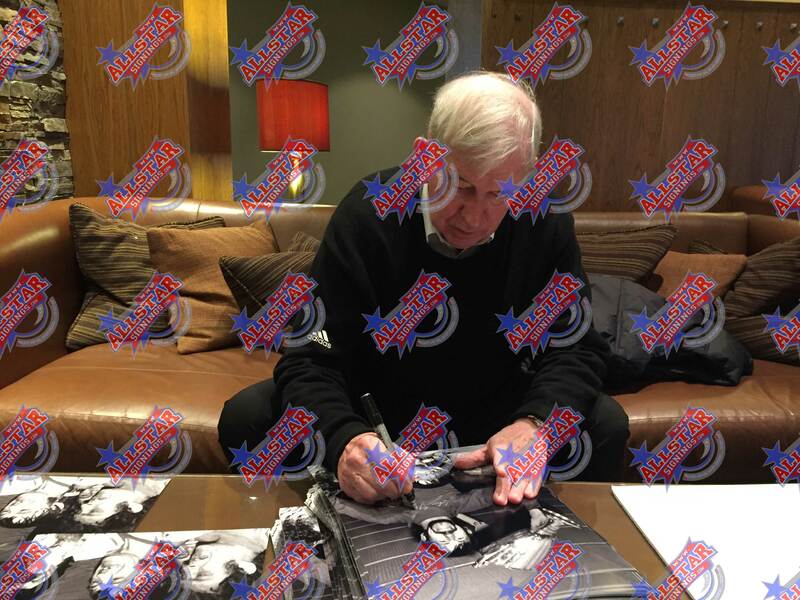 The photo was personally signed by John Greig at a private signing session 19th November 2015. 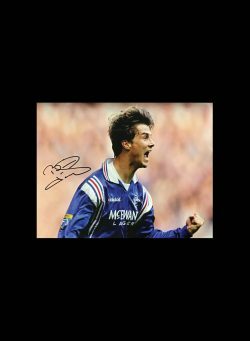 A determined, forceful player, recognised for his great leadership qualities, Greig made 755 official appearances for Rangers (498 in the domestic league, 72 in the Scottish Cup, a club record 121 in the League Cup and 64 in European tournaments). He scored 120 goals for the club and won three domestic trebles. 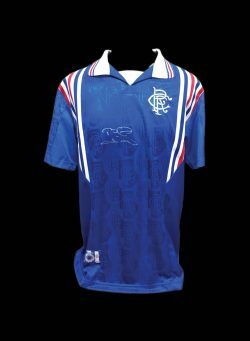 Greig actually started his career with Rangers as a forward, prior to being moved back to midfield – playing initially alongside another Rangers legend in Jim Baxter – and finally to left back. It was therefore in those initial years that he scored the majority of his goals for the club. 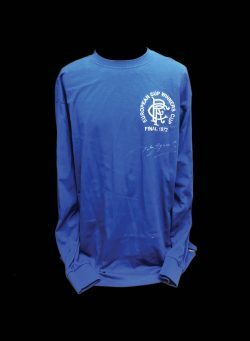 Greig was captain when Rangers won the European Cup Winners Cup in 1972 beating Dynamo Moscow 3–2 in Barcelona. 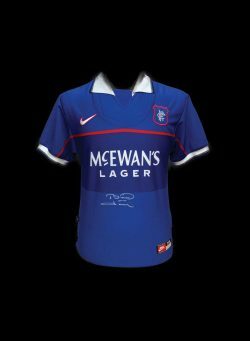 Although Greig’s was an enormously successful playing career, his captaincy coincided with a period of sustained success for Rangers’ city rivals, Celtic, from the late 1960s until the mid-1970s. 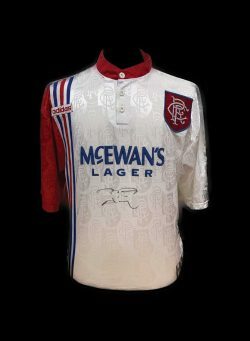 Greig’s fortitude during that period further cemented his reputation as one of Rangers’ most celebrated captains. 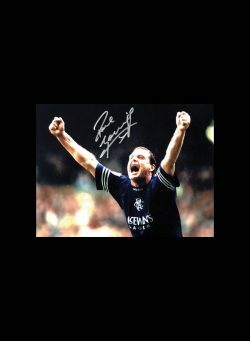 Paul “Gazza” Gascoigne signed photo.